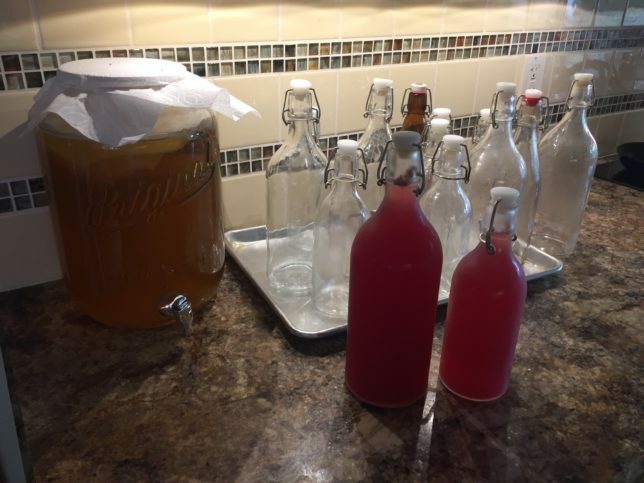 kombucha – Mark Follmer, P.E. For primary fermentation I use a 7-liter approx. 2 gallon tea jar, with a spigot near the bottom. Obtained from Bed Bath & Beyond, etc. Do not put a tight-fitting lid on the jar. I cover the top with a double layer of paper napkins, secured with a rubber band to let air in and keep everything else but kombucha out. This batch size is about double the batch size of many/most of the recipes I see on the internet, which are about one gallon. I “download” from the tea jar into 0.5- and 1-liter bottles. I generally get 5 or even 6 liters of bottled tea per batch. I have about a ten liter fleet of swing-top bottles that I got from IKEA and from on-line, probably Amazon. The bottles are durable and contain the fizz! After the seven-day primary fermentation, I allow 3 more days for secondary sedimentation at room temperature, then the bottles of kombucha may be chilled. I put the bottles in the refrigerator at three days because the faster fermentation process at room temperature may let the bottles ferment too far with messy results. 16 – Lipton Black Tea Bags. Feel free to experiment, with kombucha there is a lot of room for error. Winco Tea Bags also work just fine. Lately I have been using green tea. It makes a lighter-colored product. I just don’t happen to own one of those tea-balls or I would try bulk tea. Water: For making the tea I use as much as my biggest pot can comfortably hold. As the water comes to boil, add the sugar and dissolve it, then throw in the tea bags. While this water boils for the next batch, pull the SCOBY out of the jar with your clean hand or glove and put it into a pitcher or large measuring cup. Then pour about 2 cups of the now-fermented kombucha on the SCOBY, cover, and set aside to start the next batch. After the jar settles down most of the organic characteristics of the brew will have either sunk or floated. So I think I get pretty good kombucha, even though it is unfiltered. Natural kombucha will probably always have a sediment and few strands of primordial SCOBY floating around. Let the tea cool until it is below a temperature that will not kill the SCOBY. I don’t know what temperature that would be, so let’s say room temperature or lukewarm. It takes a long time to cool that much tea. I set the pot with the about-2-gallon batch of this very sweet tea into my sink and then pour all the ice out of my refrigerator ice maker over it. Then I still have to wait six to eight hours for it to cool. After this tea has cooled you will be returning it to the jar, plus the SCOBY, at least one to two cups of starter tea, and enough water to fill to the neck of the jar. Starter tea may come from your previous batch or any unpasteurized or whatever kombucha you have. After the tea has cooled, pour it into the primary fermentation jar. Carefully replace the SCOBY and starter tea on top and add water up to the neck of the container. I place a double layer of paper towel secured by a rubber band to keep all kinds of contaminants out. I use fresh paper towels every batch in an effort to keep everything clean. Wait seven days and begin the bottling process again. After the seven-day primary fermentation period it is time to bottle. Have your bottles ready to go. They should be absolutely clean and sterile. This is the point where flavoring, and more sugar, is added for the secondary fermentation process. Berries, spices, honey, or fruit juices can be added. The simplest recipe I have found is just to add about 2-1/2 cups of grape juice. I use Costco Concord grape juice. This much juice is equivalent to about 1/2 cup of sugar. It is important to not use anything that would stop the fermentation process, so anything with a preservative should not be used. Another easy flavoring is about 2 cups of blueberries and about 1/2 cup of sugar. Boil, mash, strain, and pour into the jar. There are many recipes on the internet that use turmeric, ginger, and all kinds of spices and fruits. During the fermentation process sediment will accumulate on the bottom of the jar – fruit fiber and yeast. There will also be particles floating around, as well as the SCOBY (usually) floating on top. You can decide how to strain the kombucha when you bottle it. I don’t. I carefully fill the bottles, and pour my glass with the finished product, with a minimum of disturbance. It doesn’t hurt to consume the yeast, bits of fruit fiber, or SCOBY, but some people don’t like to. Some people don’t even eat bread crust. This is personal preference. I carefully drink unfiltered kombucha because I haven’t found an easy and effective way to strain it. Fill the bottles from the spigot. When you get down to the dregs, you are done bottling this batch. Pour it out, wash it out with plain water. Never contaminate the inside of the jar with anything but kombucha. After three days, just put these newly-filled bottles in the refrigerator and enjoy.